NHIDCL Notification is out. NHIDCL is recruiting for 28 Deputy General Manager Govt Job Posts. 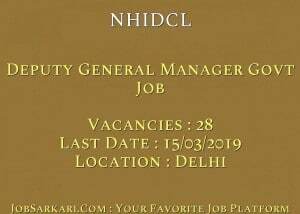 You can check NHIDCL - National Highways & Infrastructure Development Corporation Limited last date, download NHIDCL notification, visit NHIDCL official website and check other NHIDCL Vacancy details.Complete Vacancy and recruitment Details about 28 Deputy General Manager Govt Job vacancies in NHIDCL are provided below by JobSarkari.Com only for you. Last Date for Receipt of Application Form. 15/03/2019. Deputy General Manager (Tech./Project) Candidate Must Have Passed Degree in Civil Engineering and Having Experience Analogous Posts on Regular Basis in the Parent Cadre or Department in the Pay Matrix Level-12 of 7th CPC. With 03 Years Regular Service in the Pay Matrix Level-11 of 7th CPC. Having 09 Years Regular Service in the Pay Matrix Level-10 7th CPC and 09 Years Experience in an Organized Service of the Government of india oe Equivalent Level Post or Higher and well Versed in the Field of Roads/Highways/Bridge/Engineering. Maximum 55 Years. 28. Director (A&F), National Highways & Infrastructure Development Corporation Limited, 3rd Floor, PTI Building, 4-Parliament Street, New Delhi – 110001 On or Before 15th March 2019. Q. What is the Last Date For NHIDCL Deputy General Manager Govt Job Vacancy ? A. 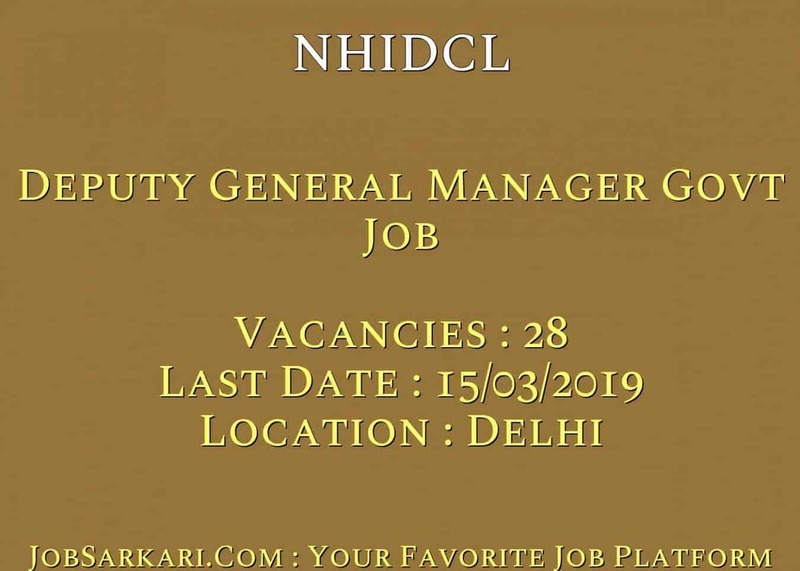 Last Date for NHIDCL Deputy General Manager Govt Job Posts is 15/03/2019. Q. What is the Form Type of NHIDCL Deputy General Manager Govt Job Recruitment ? A. The Form Type for NHIDCL Deputy General Manager Govt Job Posts is Offline. Q. How many vacancies are available in National Highways & Infrastructure Development Corporation Limited Deputy General Manager Govt Job Posts ? A. There are about 28 Vacancies in National Highways & Infrastructure Development Corporation Limited Deputy General Manager Govt Job Posts. Q. What is the Full Form of NHIDCL ? A. Full Form of NHIDCL is National Highways & Infrastructure Development Corporation Limited .